Due to limited budgets and reduced inspection staff, state departments of transportation (DOTs) are in need of innovative approaches for providing more efficient quality assurance on concrete paving projects. The goal of this research was to investigate and test new methods that can determine pavement thickness in real time. Three methods were evaluated: laser scanning, ultrasonic sensors, and eddy current sensors. Laser scanning, which scans the surface of the base prior to paving and then scans the surface after paving, can determine the thickness at any point. Also, scanning lasers provide thorough data coverage that can be used to calculate thickness variance accurately and identify any areas where the thickness is below tolerance. Ultrasonic and eddy current sensors also have the potential to measure thickness nondestructively at discrete points and may result in an easier method of obtaining thickness. There appear to be two viable approaches for measuring concrete pavement thickness during the paving operation: laser scanning and eddy current sensors. Laser scanning has proved to be a reliable technique in terms of its ability to provide virtual core thickness with low variability. 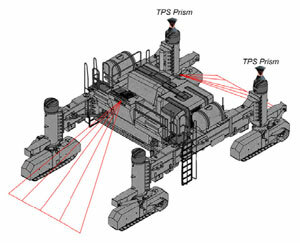 Research is still required to develop a prototype system that integrates point cloud data from two scanners. Eddy current sensors have also proved to be a suitable alternative, and are probably closer to field implementation than the laser scanning approach. As a next step for this research project, it is suggested that a pavement thickness measuring device using eddy current sensors be created, which would involve both a handheld and paver-mounted version of the device.